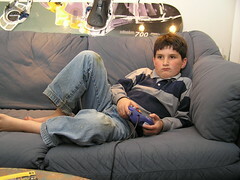 December 2006 – Planet Geek! <Xilet> everytime you uninstall sendmail, an angel gets its wings. Ads are ads are ads. They generate revenue, they are the lifeblood of many websites. On most days, I can tolerate them. But when a website I’ve been using for a decade, a site that is truly the core of much of the Linux community, for all its faults, supports an ad so blatantly sensationalistic, with no bylines, no disclaimers, and in fact nothing to say this IS in fact an ad, I find my bile rising. This really isn’t the place to go into whether Windows or Linux is more appropriate in the data center – that’s been hashed, rehashed, and argued ad nauseum. What bothers me is seeing this sort of IN YOUR FACE advertising on a site that really is against all that this ad represents – the blind marching toward the All Savior of Microsoft, only they can run our data center! Only they can run stable servers! Ads are ads, as I said. 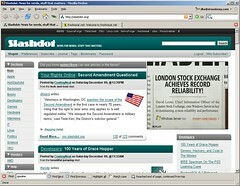 But Slashdot, shouldn’t this bother you, even a smidgen? About 2 months ago, I picked up the Blueant X5 headphones, and had high hopes of them being my primary audio interface to my machines. Unfortunately the Treo fell down pretty hard as my primary music player, but I’ve managed to shift over to other sources, and today I had my first “okay, that worked really well” moment. As most folks know, clipper is my primary platform now, and, despite it being saddled with WindowsXP, has been doing pretty well by me. One of it’s drawbacks was that it did not have a bluetooth adapter in it. I played around with a USB BT dongle, but was very frustrated with the support stack for it. I eventually picked up a card specifically for the Dell D620, and installed it. Ahh, much better – built in bluetooth and no dongle. A little fiddling, a call or two to Blueant, and I had the headphones configured properly for basic stereo music listening. This has been very pleasant, as I can listen comfortably without dealing with cables or plugs or the like. The only drawback has been that the microphone arrangement has a very low sensitivity, so it hasn’t worked well using X-lite. Despite this, getting 8+ hours of listening time on a usb-charged battery really does go a long way to making them useable. Today, I was sitting in a hotel lobby (a comfortable environment for me), doing my work on my laptop, availing myself of the free wireless, listening to music, when a call came in on my Treo. The X5 headphones happily switched into ‘handsfree’ mode, and trilled a little “You have a call” sound. I touched the button on the side of the headphones, and lo! I was talking to my wife. The call went along, and when we were done, I touched the button on the headphones again, and RadioParadise was once again in my ears. At no point did I touch my cell phone. It’s nice when technology actually works. Now if I could have my laptop always streaming audio, and function for 8+ hours on a charge, and have ubiquitous network access, and NOT feel like I’m holding a small fusion reactor on my lap, all would be perfect! Redhat geekery and, of course, swag! Got to attend a Redhat presentation today on virtualization. They were pushing a lot of very interesting stuff, and while the marketing drivel was in fact kept to a minimum, they did pitch RHEL5 pretty hard, as well as their relationship with Intel. Of course, the important stuff is the SWAG! Today’s haul was a 256meg stainless pen drive – all in all, one of the better bits I’ve seen at presentations. It’s stocked with all the presentation data, so that’s nice, and it’s sort of pretty. I have to admit, part of the goal of this was successful with me. The stuff going on with Xen and RHEL is pretty impressive, including cluster management and ‘paravirtualization’ (basically environments that realize they’re virtualized, and can be managed easily via standard API’s). Moving forward on platform design for my clients and for my own hosting stuff, I’ll take RHEL into serious consideration (and not just because they said at the meeting here that RHEL5 will be Yum based, not up2date). The drawback is that the Xen stuff doesn’t really support Windows as virtual guests. For that I’ll need to focus on VMware. (The other option is naturally Microsoft Virtual Whatever, which, in my experience, has been frighteningly unstable and buggy. I can’t boot my Kubuntu CD into it (installation locks up), and I’ve had serious keyboard issues even trying to configure the installer. I’ll hold off on a full rant against this until I’ve tried vmware, but at the moment, I’m unimpressed with Virtual PC. Oddly enough, Zach is the one who asked for this. 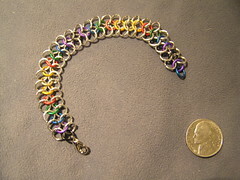 I just finished stocking up my chainmail box so i could start doing some more interesting work using aluminum rings, and using anodized rings for color. Zach asked if I could make him a quick bracelet, so I whipped this one up in about 20 minutes. Working with aluminum (as opposed to the steel I normally use) is on the one hand refreshing. It’s much softer and lighter. On the other hand, it’s not particularly strong, so anything that takes tension will deform pretty easily. It’s okay for jewelry, but I’m not going to make armor with it. After finishing this piece, I decided to post a picture of it, and thought “what the hey”, and posted pictures of all the other pieces I’ve done for people. They’re now up on Flickr in a full set. About 10 years ago, I started writing an application that would have a profound impact on my life. Keystone started out a simple problem tracker, grew into a mature product that was getting 3000+ downloads everytime I did an update (about once every 3 months), and was ultimately sold to a DotCom that basically killed it in its tracks. That sale let me have a few toys and was a high point of the dotcom bubble for me. 3 years ago I re-aquired the rights to the application from the failed dotcom, and set about upgrading the vastly outdated software. My user base had for the most part wandered away to other applications, but there was still interest and heck, it was my application, I wanted to do things with it. But other projects were taking precedence, and Keystone languished. In those 2 train rides, I did more upgrading, tinkering, and fixing in Keystone than I’ve done in the last 3 years. I revived the contact manager and fixed all the dependency problems. I continued the changes needed to bring a PHP application, written in 1995, up to 2006 standards. Keystone is over 12,000 lines of code – not a trivial application, but not so huge that it is an unassailable target. The question is – why do this? Sure, part of it is ‘this is my baby, I want to see it succeed’, but in the back of my head, the question burbles… “Can lightning strike twice?” – can I make this a successful opensource application again? I’m certainly not deluding myself into thinking “THIS WILL BE THE NEXT KILLER APP!” – that’s a foolish and unrealistic mindset. But can I bring it back to where people are using it, they like it, they contribute suggestions and fixes, and the application continues to grow? I’d like to think I can. But the code still needs a lot of work, and there are some design decisions that will most likely require huge chunks of code being ripped out at the roots (database connection methodology has advanced SIGNIFICANTLY since 1995). It’s a nice dream, I sort of miss my users. Maybe they’ll come back. This weekend I’m down in DC doing registration services for an event – more detail on this later, but I have to gush a moment. The hotel room here is your fairly standard ‘big chain’ accomodation, except for one minor touch. The king-sized bed has a Tempurpedic mattress on it. I’m so hooked. It’s the only mattress I’ve ever slept on where I could lie on my side comfortably, from head to toe. It gave enough in the hips to let me settle in, but supported everything else nicely. That, coupled with absolutely no motion from other occupants – I’m completely hooked. If they weren’t so fripping expensive, I’d be, er, on top of one in an instant. As it is, I need to get into a place where dropping $800 on a king sized tempur-pedic mattress is a comfortable expenditure. Not to mention we just got up a new futon, so buying another mattress now really doesn’t make a ton of sense. Ah well.